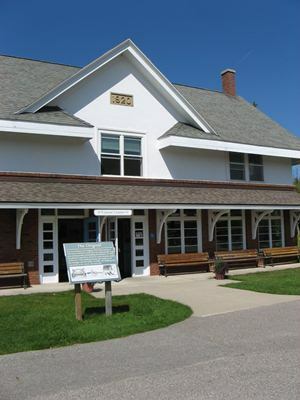 The Oden State Fish Hatchery is one of Michigan's six state hatcheries. The original Oden State Fish Hatchery was established in 1921 and continued to operate until 2002. The hatchery complex just north of the original hatchery was completed in 2002 and is one of the most advanced fish culture facilities of its kind. This fish hatchery raised both brown and rainbow trout. This facility has a brown and rainbow trout broodstock station and is a major rearing facility for those two species. The Oden facility keeps broodstock (fish that are kept to produce fertilized eggs) for three strains of brown trout and one strain of rainbow trout. This brookstock produces 2-3 million eggs per year for Michigan's hatchery system. After hatching, the fish, called fry, are put into tanks. Once they have reached 3-5 inches in length, the fish are called fingerlings and are moved to covered, outdoor raceways. The water used to grow the fish comes from five wells located on the property. Each day, more than four million gallons of water are used in the rearing process. The old hatchery has been transformed into a Great Lakes watershed explanation area featuring a Michigan Fisheries Visitors Center that includes a replica of a fish transportation rail car. The rail car has a historic recreation of the interior of the original rail car, a watershed interpretative area and an interactive computer with hands-on learning opportunities concerning watersheds and other aspects of fish culture. A trout stream was constructed in the old raceway complex and shows the public how a degraded stream can be repaired. It includes a viewing chamber to allow people to see what happens underwater in a stream. While touring the hatchery, make sure to bring dimes to purchase fish feed from dispensing machines so you can feed the trout in the pond along the way! The facility includes daily tours during the summer along paved pathways. For more information about the Oden Fish Hatchery, call 231-347-4689. The hatchery is located on US 31 in Oden.